Yess! Rhino Hero is out and about again. The super hero from the animal world fearlessly scales the highest houses looking for burglars and rogues. He is as strong as a lion and as smart as a fox but also as heavy as a rhinoceros. So even the most robust multi-story buildings may start to wobble. 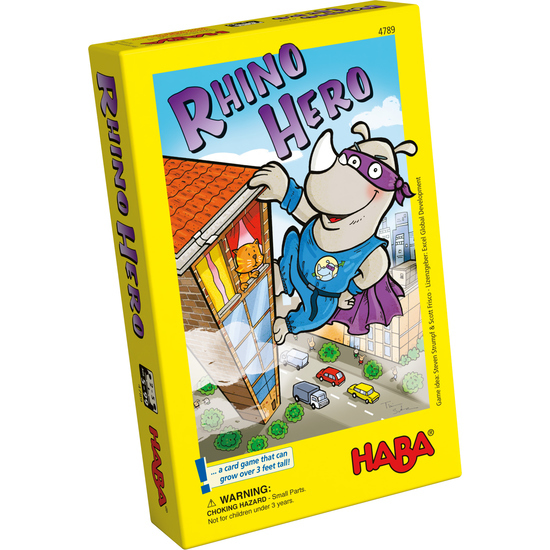 Can you help Rhino Hero accomplish his wobbly mission and build a skyscraper as tall and solid as possible? Contents: 31 roof cards (= action cards), 28 walls, 1 foundation (= starting card), 1 Rhino Hero, Set of game instructions.